Clayton Kershaw of the Los Angeles Dodgers reacts as he exits the game during the fifth inning against the Houston Astros in game five of the 2017 World Series. Justin Turner of the Los Angeles Dodgers celebrates scoring on a RBI single during the first inning against the Houston Astros in game five of the 2017 World Series. 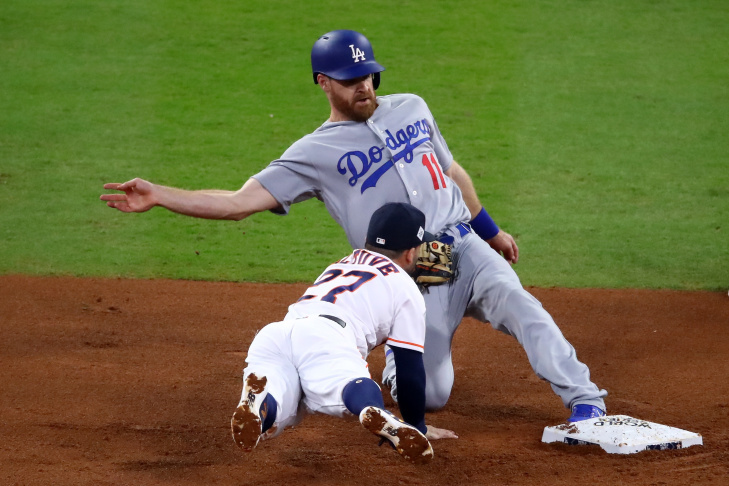 Jose Altuve of the Houston Astros tries to tag Logan Forsythe of the Los Angeles Dodgers as he gets to second base on an attempted pick off play during the first inning in game five of the 2017 World Series. 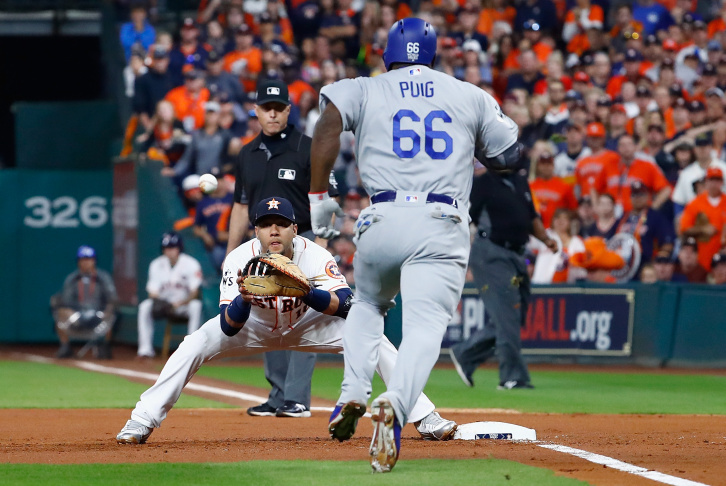 Yasiel Puig of the Los Angeles Dodgers is thrown out at first against Yuli Gurriel of the Houston Astros in game five of the 2017 World Series. 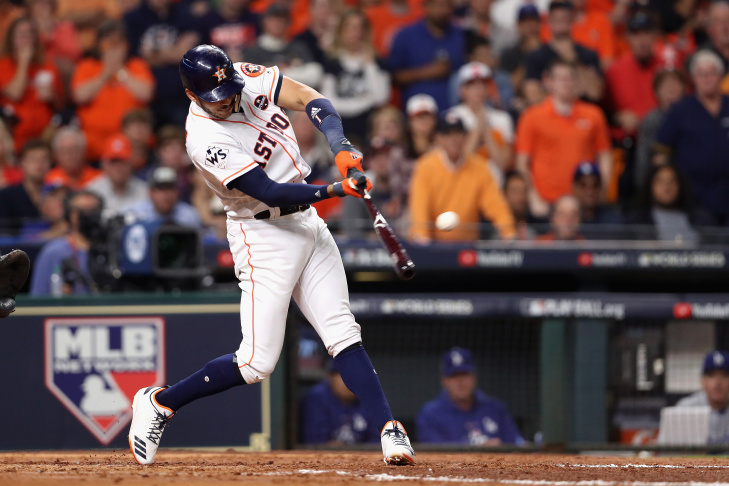 Carlos Correa of the Houston Astros hits a RBI double during the fourth inning against the Los Angeles Dodgers in game five of the 2017 World Series. 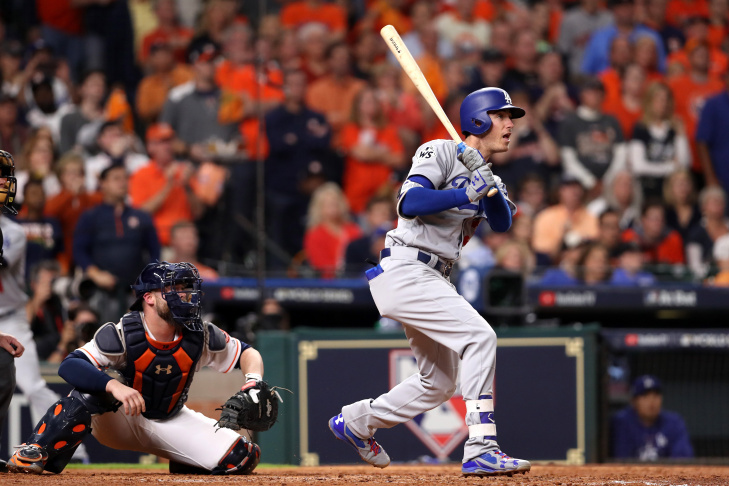 Cody Bellinger of the Los Angeles Dodgers hits a three-run home run during the fifth inning against the Houston Astros in game five of the 2017 World Series. 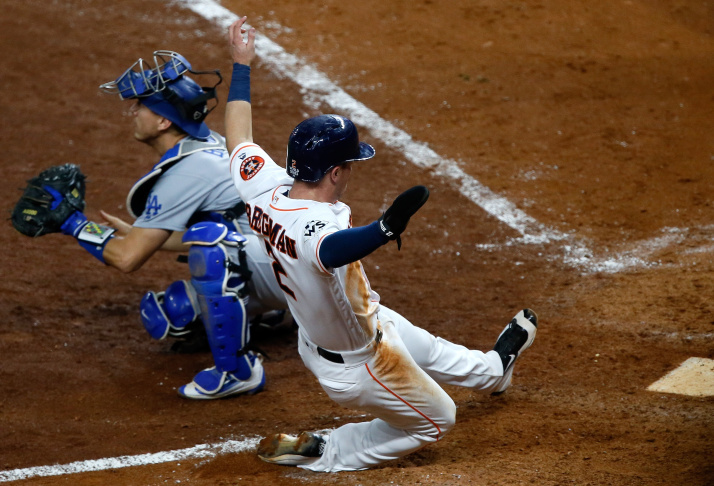 Alex Bregman of the Houston Astros slides safely in to home plate on a double by Jose Altuve (not pictured) against Austin Barnes of the Los Angeles Dodgers in game five of the 2017 World Series. Wacky and whacky with seven home runs, this perhaps topped Toronto's 15-14 win over the Phillies in 1993 as the craziest World Series game ever. 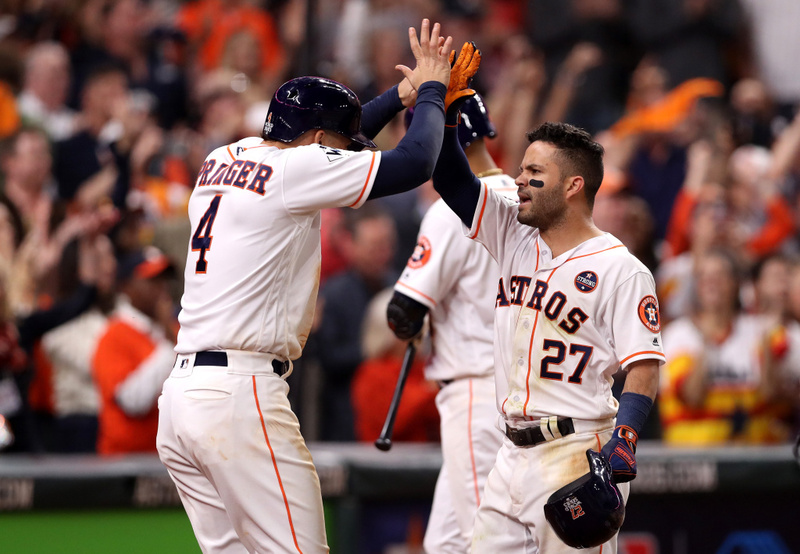 Jose Altuve of the Houston Astros celebrates with George Springer after hitting a three-run home run during the fifth inning against the Los Angeles Dodgers. 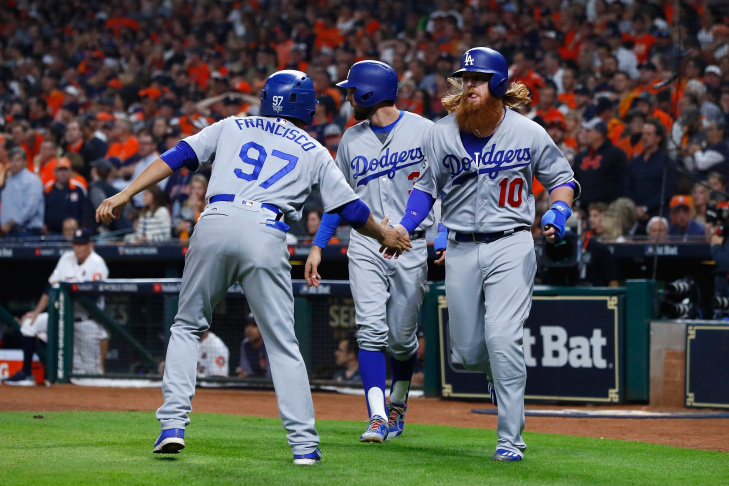 Puig lined a two-run shot in the ninth, the record 22nd homer in a single Series, and Chris Taylor's two-out single off Chris Devenski tied it. Now, with both bullpens worn down, the teams get a day to recover. 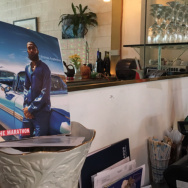 It'll be Game 6 on Tuesday night at Dodger Stadium, where Justin Verlander will try to clinch the Astros' first championship and Rich Hill hopes to save Los Angeles' season. Correa leaped and twirled after launching a two-run drive made it 11-8 in the seventh. McCann's shot in the eighth added a much-needed insurance run. 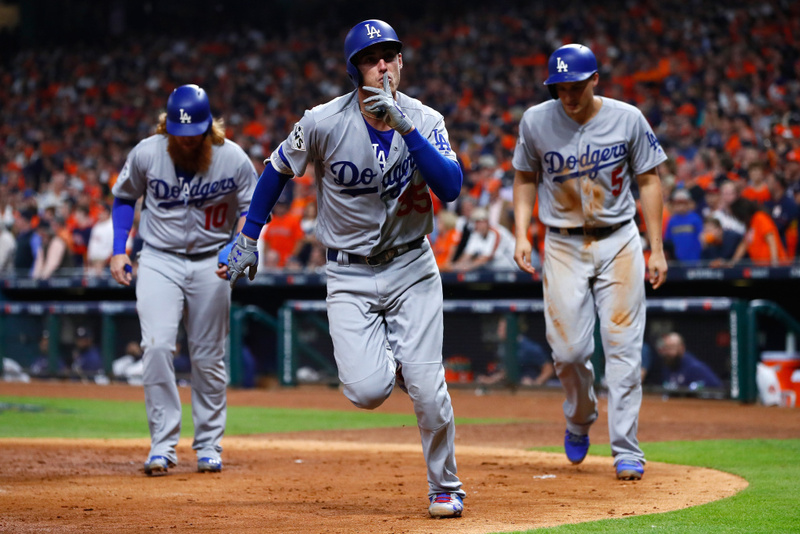 Cody Bellinger of the Los Angeles Dodgers celebrates with Corey Seager and Justin Turner after hitting a three-run home run during the fifth inning against the Houston Astros. Bellinger homered for Los Angeles, a three-run drive in the fifth that made it 7-4 and seemed to swing things back in the Dodgers' favor. By the end of the mayhem on the mound, it was a mere afterthought. No wonder there's a bright sign high above the center field wall for a popular taco place in town — it says Torchy and fit perfectly for a game where pitchers got lit up. A day earlier, Kershaw stood alone on the mound after the Dodgers' dramatic win in Game 4, trying to get a visual for the biggest start of his career. Kershaw whipped his head around to watch Gurriel's drive sail, his face immediately showing shock, utter disbelief and frustration, all wrapped up in one expression before he bent over, hands on his knees. Gurriel's second homer of the Series also kept open this possibility: Imagine the scene if Major League Baseball presents Gurriel with the MVP trophy, so soon after Commissioner Rob Manfred suspended him for the first five games next year for making a racist gesture toward Dodgers pitcher Yu Darvish. The Dodgers hadn't lost a game this year when they led by four runs. 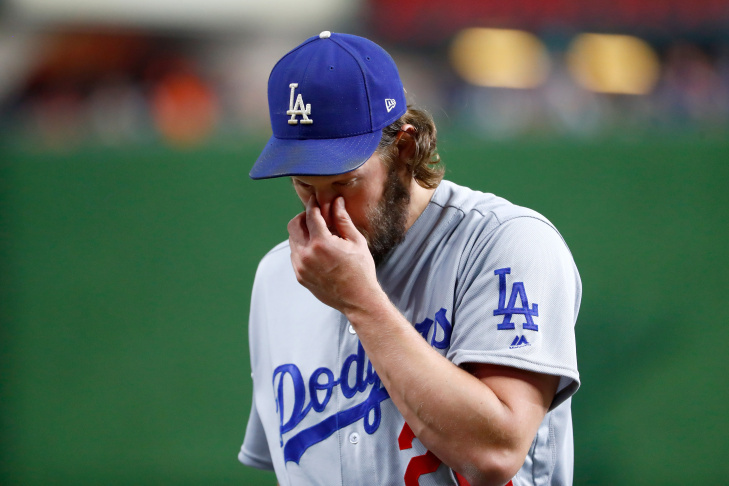 But Kershaw's bedeviling postseason past came back to haunt him at the worst time.